The citizens of Iceland today celebrated the anniversary of the founding of their republic. On June 17, 1944, Iceland declared independence from Denmark and The Republic of Iceland was formed. June 17 was the chosen date in honro of the birthday of Jon Sigurdsson, or “President Jon,” the leader of the 19th century Icelandic independence movement. The National Day is celebrated across Iceland with parades, speeches, concerts, dance performances, street artists and ab array of activities for children. 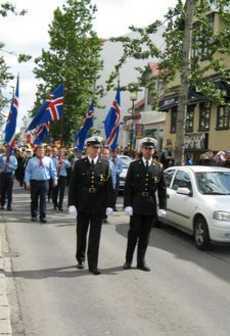 The national day procession in Reykjavik June 17, 2007. At DC, US Secretary of State Hillary Rodham Clinton sent her best wishes to the people of Iceland as they celebrate their National Day. She says Iceland and the United States share a long history as allies, partners, and friends. The United States remains committed to preserving our common defense and working closely together to address some of today’s greatest challenges, she added. In Afghanistan, both countries are collaborating to create a more stable and prosperous future. In the Arctic, experts from both countries are conducting research to support sustainable development and better understand climate change, Ms. Clinton said. Both countries’ students and scientists are working together to better understand and harness geothermal energy. And around the world, both countries are promoting democratic principles and expanding human rights. For over 100 years the United States has been one of Iceland’s most important trading partners and the United States is the second largest exporter to Iceland following the European Economic Area, and the largest foreign direct investor in the country. In return, Iceland finds a ready market in the United States for its world famous seafood, technology, creative industries, logistics and unique tourist destinations. On 30th of May this year, during a half-day conference and luncheon hosted by the Icelandic-American Chamber of Commerce (IACC) at the Embassy of Iceland in Washington, D.C., Icelandic and American business and government speakers discussed investment opportunities in Iceland and for Icelandic investors. The event, held in cooperation with the U.S. Department of State and celebrating 70 successful years of diplomatic relations between the countries, featured speakers covering a range of topics: Iceland’s most promising investment sectors, competitive energy costs, responsible fisheries and tourism.